Marijuana consumers and rights activists have praised Colorado for its role as one of the first states in the nation to legalize marijuana for recreation. The move was touted as not only good for consumers, but also for states hoping to cash in on the tax dollars. However, it seems that legalization may not be bringing in as much tax revenue as expected – and that’s because the increased availability has driven down costs. 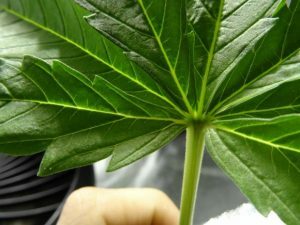 Vox.com reports new data from the Colorado Department of Revenue shows that the wholesale price of cannabis has fallen 22 percent since recreational sales first started three years ago. It’s now at about $1,470 from $1,880. That’s a stark change from what we saw immediately after legalization, when prices soared to $2,865 per pound when there was a short supply and high demand. Prior to legalization, the wholesale price of marijuana could reach as high as $5,000 per pound. Speculation is that these prices aren’t done falling. Drug policy experts say once mass production really kicks into high gear, the price per pound could reach somewhere between $30 or $45. That’s because even in Colorado, there has to be some consideration of the fact that the drug is still illegal for recreational purposes in most other places in the country. This drives marijuana tourism in Colorado, which will likely drop off if and when the drug becomes more readily available in other states. This price drop wasn’t exactly a surprise. Some have even argued that ultimately, marijuana shouldn’t cost anymore than a bag of tea because, after all, both are really just plants. Of course, for consumers, this would be great news. However, there are other reasons why there might be cause for concern about this. Part of the issue is the concern about lower generation of tax revenue. The majority of states that have legalized did so by taxing marijuana a set percentage. So for instance, if the wholesale price is $1,400 as opposed to $1,800, states are going to be generating less revenue. The only way a state would be able to make up for that would be to impose additional taxes. Some policy wonks have suggested taxing marijuana with a single, flat price per ounce. But it’s not all bad news. When more consumers are able to legally access the drug, the black market will begin to crumble. That has so many benefits – not just from a taxation standpoint (less tax dollars needed on criminal prosecutions), but it also bolsters public safety. Marijuana has long been a cash cow for drug cartels. Legalizing the drug pulls the rug out from underneath them. Some analysts believe exports of marijuana used to comprise about 30 percent of all drug export revenue. That means we could be reducing their profits by a third. These are the same organizations that not only exact violence among those within criminal gangs, but are also involved in human trafficking and other endeavors. These gangs probably won’t be wiped out completely with marijuana legalization, but they can it does serve to weaken their position. The bottom line is there are pros and cons to the reduction of price of marijuana. Navigating these waters and balancing these interests will be a challenge for advocates and policymakers in years to come.